Can help you lose weight?!? Yes it's true. Chocolate for breakfast, believe or not, can help you burn calories faster, according to scientists. Namely, avoiding tempting things can cause psychological dependence, that is, a condition in which we constantly long for what we cannot have. 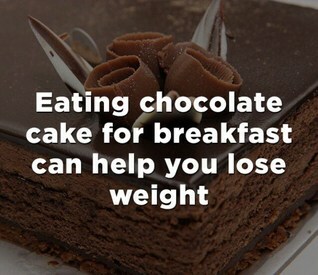 But some studies have shown that if we eat something chocolate for breakfast, such as a good chocolate cake, it will stop our desire for chocolate during the day and help us get rid of unwanted pounds faster. Eating chocolate for breakfast will help us lower our weight and maintain the weight longer, according to researchers at Tel Aviv University.